Asiye MERİÇ graduated from the Faculty of Pharmacy, Anadolu Univ. 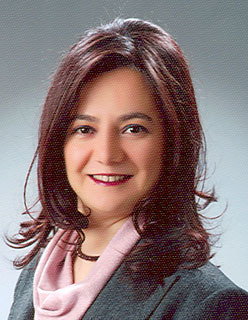 (Eskişehir, TR, 1990) as Pharmacist and got her PhD (1997) from Pharmaceutical Chemistry field at the Anadolu Univ. working on the research of synthesis, analysis and analgesic activities of some imidazole derivatives. Then she appointed to Assistant Professorship in this Faculty (1998), she continued her studies as both of researcher and lecturer. This was followed by postdoctoral appointment with Prof Dr. Alan R. Katritzky from Univ. of Florida (Gainesville, FL, USA) working on “Heterocyclic Chemistry” (2001) and Dr Isao Iwataki from Nippon Soda Corp. (Alachua, FL, USA) working on ‘synthesis of insecticidal 2-iminothiazole derivatives’ (2001). She worked as postdoctoral researcher to study on carbohydrate chemistry at the Univ. of East Anglia (Norwich, GB) under the guidance of Prof. A. Rob Field, with “the British Council, Exchange and Visits Programme Fellow” (2003). Then she joined to “Wolfgang Sippl Group” from Martin-Luther Univ. Halle-Wittenberg, Inst. of Pharm. Chem. (Halle-Leipzig, D) to learn molecular modeling techniques for drug discovery with the DAAD-“Research Stays and Study Visits for University Academics and Scientists” Programme Fellow (2008). After receiving her Associate Professorship at the end of 2008, she appointed to Deputy Dean of Faculty of Pharmacy, Anadolu Univ. (2010) and she completed this administrative work on 2013. Her research interests are Pharm.-Med. Chem., Organic-Heterocyclic and Carbohydrate Chem., Enstrumental Analysis Technics i.e. UV, IR, NMR, MASS Spectroscopy, Qualitative and Quantitative Structure-Activity Relationships (SARs and QSARs), Computer Aided Drug Design (CADD), Molecular Modeling and other latest relevant topics to Pharm.-Med. Chem. Her latest completed research project focused on the synthesis of heterocyclic compounds, promising as antiparasitary and now “Enhancer of Zeste Homolog 2 (EZH2) Inhibitors, Their Structure-Activity Relationships and Design of Novel Derivatives” entitled research project is approved and in progress as of February, 2017. Pharmaceutical and Medicinal Chemistry, Organic Chemistry, Heterocyclic Chemistry, Analytical Methods, Structure-Activity Relationships, Carbohydrates, Computer Aided Drug Design (CADD), Molecular Modeling and other latest relevant topics to Pharm.-Med.